The latest happenings at Small Bites by Jessica, plus this week’s Link Love and Menu Plan Monday with lunch and dinner! Hope you all had a great weekend! I don’t know where ours went, but here we are at the start of another week. In case you haven’t been over to the blog since last Monday’s menu plan post, be sure to check out my recent posts about Chicken Myths & Truths (plus over 35 healthy chicken recipes to keep it interesting) and my Late Summer Vegetable Soup. Yesterday I had some fun in the kitchen with the girls while we made a batch of my Veggie & Bean Quinoa Bites. They’re perfect for the lunchbox, especially if you need to send your kids nut-free, vegetarian meals like I do. You can see a bit of the girls in action over at Instagram – they had a ball helping me make them and it got them so excited to pack their lunch for today. Make sure you check below to see what else is on the lunch menu for the week. And just a head’s up that Menu Plan Monday will resume in two weeks as I will be away speaking at a conference next week. 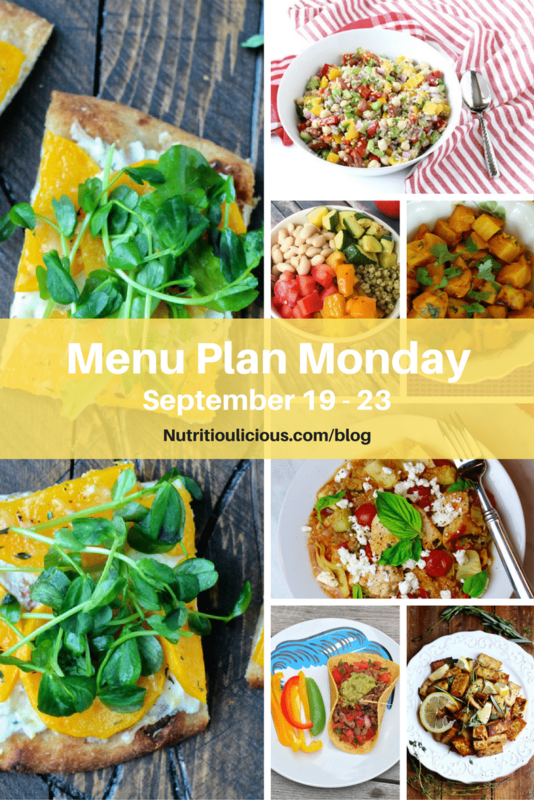 Check out the MPM archives or my Meal Planning Pinterest board to help you plan while I’m away. Enjoy all the great articles below and have a wonderful week! ⇒ I certainly get cravings, and I’m sure you do too. Alissa provides great tips to help you get through them without giving in. ⇒ While I love cooking from scratch, time is limited these days, which is why I like having some staples on hand like Dixya. ⇒ I absolutely love cooking, but I know not everyone does. If you fall into that latter camp, you have to check out Meme’s post and her new course of the same title! ⇒ Great Facebook Live video from my friend Deanna about making sweet and delicious caramelized onions and what you can do with them once you have ’em! ⇒ I’m not quite ready for pumpkin season yet, but when I am I will definitely be making these! ⇒ 5 ingredients (two of which are honey and garlic) and 15 minutes – what could possibly be bad about this recipe? (Hint: Nothing!) Let’s add it to the 35+ Healthy Chicken Recipes I shared last week! ⇒ This bowl is a perfect example of a balanced meal all in one. It’s already on this week’s menu plan for dinner and lunch leftovers for the girls! ⇒ This reminds me of shakshuka, one of my fave egg dishes. So easy and delicious! ⇒ Another sign I need to get into fall gear over here! These mini muffins look like a fun addition to the lunchbox and mommy’s happy that they’re filled with yogurt! ⇒ This looks delicious and such a great way to keep the summer feeling going all year long! What have you been sending to school for lunch for the kids? So many great recipes I need to try! Thanks for including my honey garlic chicken! You’re most welcome! Can’t wait to make it. Hope you find some new recipes you enjoy! Those flatbreads… I need to get my hands on butternut squash stat!! Yes you do! They were so delicious! Pumpkin Rolls, pumpkin muffins…and ‘how to enjoy cooking’. LOVE! Thanks for including Deanna’s tip! Thanks Serena! So much good stuff people are posting! Another adorable video of your girls! It looks like they really love being your little sous chefs- so cute! Thanks for all the great articles and recipe links- doesn’t Meme’s course look great? Your girls are so totally adorable! Great recipes and reads, as always! I see butternut squash popping up in the menu!! 😀 YUMM! You sure do! Twice this week. So delish! So many delicious dishes! Sounds like a good week!